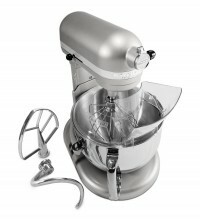 The Professional 600™ Series 6-Quart Bowl-Lift Stand Mixer is perfect for heavy, dense mixtures. 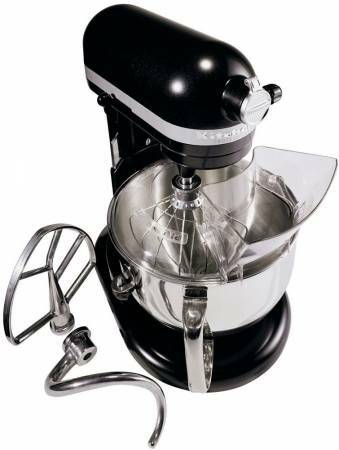 Equipped with a high-performance, professional-level motor, the Professional 600™ Series mixer can effectively mix up to 14 cups (3.3 L) of all-purpose flour per batch. Powerfully churns through yeast bread dough and triple batches of cookie dough. 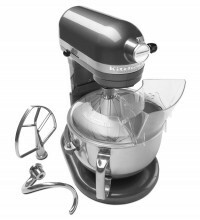 This model includes a burnished metal flat beater, PowerKnead™ spiral dough hook and 6-wire whisk will help you mix, knead and whip ingredients into culinary masterpieces quickly and easily. Its 6-Qt. stainless steel bowl with comfortable handle offers enough capacity to mix dough for 13 dozen cookies, 8 loaves of bread or 8 pounds of mashed potatoes in a single batch. The bowl is also dishwasher-safe for quick and easy cleanup. The bowl-lift design provides sturdy bowl support for stability when mixing heavy ingredients or large batches. 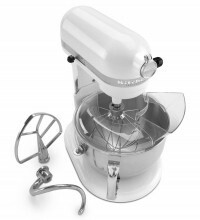 The lever smoothly raises the mixing bowl into position for efficient beater-to-bowl contact.